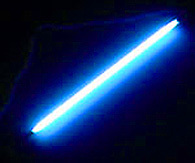 Fluorescent lamps use 25–35% of the energy used by incandescent lamps to provide the same amount of illumination (efficacy of 30–110 lumens per watt). They also last about 10 times longer (7,000–24,000 hours). Improvements in technology have resulted in fluorescent lamps with color temperature and color rendition index that are comparable to incandescent lamps. You can use the chart below to compare these types of lamps.